“You may say I’m a dreamer; but I’m not the only one.” John Lennon. OT: Pharaoh, Nebuchadnezzar, Joseph (son of Jacob), Daniel, the butler & baker of Pharaoh, Jacob/Israel, Abimelech, Solomon, Ezekiel, Balaam, Isaiah, Habakkuk, Abram/Abraham, Nathan, Ahijah, Iddo, Hezekiah, Job; plus some false prophets, too. NT: The wise men, Joseph (stephfather of Jesus) a few times, Mrs. Pontius Pilate, Paul, Peter, James, John, Cornelius, Ananias, and many more. BOM: Lehi, Nephi, Omer, for starters. D&C: Joseph Smith, Sidney Rigdon, Oliver Cowdery, to name a few. POGP: Moses, Abraham, Joseph Smith come to mind. I have found that many converts to the church have similar pre-conversion spiritual experiences (dreams, visions, intuition, etc.). They seem to be the type of people who are attuned to those feelings and imbue them with personal meaning, whether they are in or out of the church. Some anti sites dismiss claims of spiritual feeling within the church as being similar to what one might experience watching a romantic movie or a particularly touching long distance commercial. These comparisons have nothing in common, IME, with an actual spiritual experience. To me these dismissals sound a lot like Paul’s warning in Timothy 3:5 that in the last days people will have “a form of godliness but denying the power thereof.” In our day, it’s much more common to dismiss spiritual experiences as hypersensitivity, superstition, PMS or emotional instability (was that redundant?). Remembering dreams is often difficult. We work out problems in our sleep, so the source of inspiration is often our own subconscious vs. divine intervention. Dream language and meaning differs from waking life and is often more symbolic with parallel meanings about one’s emotional life. It’s personal and may not have significance for anyone but ourselves. Physical constraints – walking uphill and the hill gets steeper and steeper until you are going to fall over backwards, trying to crawl through a space that’s too tight, being too tired to move at a normal speed. These generally deal with the stress of being exhausted or overwhelmed. Time to get a massage. Path in life – inability to reach a desired destination, being in a car that can only drive backwards, being driven by someone else, the road beneath you disappearing or being difficult to navigate. These generally deal with frustration at achieving one’s goals in life or the direction one’s life is heading. Time to get back on track. Tested – sitting for a test without being prepared, returning to one’s earlier school days and not knowing where to go, forgetting one’s locker combination. These generally deal with the stress of being found inadequate. Time to get over it. Exposure – needing to go to the bathroom but not finding a suitable location, being naked in front of people, losing something you consider essential (like your teeth). These generally deal with stress about loss of composure or how others view you. Or maybe you should be sure to brush your teeth and go to the bathroom before bed. Just a thought. Discovery – inheriting a house or property that you find is much larger or grander than expected, finding lost treasure or something of sentimental value, etc. These dreams relate to personal growth: discovering a gift or quality within yourself. These are my favorites! Danger – being attacked by a vicious person or animal, being lost in a place that fills you with fear, trying to protect a child or animal from danger. These can relate to fear and anger within us. Time to chill-ax (as my 13-year old would say). Emotional parallels. Most dreams, recurring or not, can be understood if you listen to them for parallels to emotional life. People usually represent facets of your own personality, sometimes archetypes, and occasionally those people themselves. Ask yourself: what is the significance of this person to me? How am I like this person? How do I feel about this person? Lucid dreaming. A lucid dream is when you realize you are dreaming while you are in the dream. Sounds a lot like a vision to me, although most lucid dreams quickly become silly. There are a few easy ways to tell you are dreaming: look at an analog watch or clock (you can’t make it work right in a dream), try to read a book (the words will either swim on the page or the pages will be blank, flying (remembering, oh yeah, I can fly), or a really easy one is to just take off your clothes (that almost never happens in real life, but somehow passes without comment in dreams). Some people like to go crazy with this stuff and live a whole different life in dream-landia, free of the restraints of superego. To them I say: don’t ask, don’t tell. Sleep paralysis – this is when you become aware that you are sleeping, but you are so deeply asleep that you can’t move. You may imagine you are lying in your bed and someone is in the house, but you can’t move. I sometimes imagine that a cat just walked on the piano keys downstairs (which is weird since we don’t have a cat). Theories exist that this is the basis for alien abduction experiences (vs. actual alien abduction) or the basis for medieval demon encounters. It just reminds me that I’m glad we don’t have an actual cat. I went to a minister who said he had my name in his book, but it wasn’t there. I knew it wasn’t true, even though he was insistent. I met a dead relative who told me something important was going to happen to me soon. So, are converts more susceptible to spiritual dreams and/or visions? Are all members of the church? Does this extend to other spiritual gifts? Have you heard of these types of experiences? Are they common or rare? Are they hereditary gifts or are they skills one can develop? Are dreams the same thing as visions? Do the same rules apply? And is it inspiration or just head games for one? Discuss. I often wonder if the reason I don’t have visionary dreams of the sort you discuss is because in a post-Enlightenment, post-Freudian world I myself am not particularly open to that mode of communication. I have had at least one experience that belies that, but in general, I tend to think of dreams as the boiling subconscious, not a spiritual meditation waiting for divine intervention. So, I’d like to believe, I have reasons to believe, but I generally think I’m not open to dream-communication, and that probably a lot of other educated people will find themselves in the same boat. I’m not sure if these are unrelated events or just folklore but its interesting to think Richard Bushman maybe put it down as a possibility- read more about Black Pete and Datura!! I think its more of a conspiracy theory but its interesting!! I would like to have more spiritually significant dreams—or, at least, be able to remember them—but methinks I am not religious and spiritual enough in my waking life to draw that kind of revelation. Someone once asked: What is the difference between God speaking to you in a dream, and dreaming that God spoke to you? Early Church members wanted a direct experience with God and believed that Joseph Smith had the power to allow them their request. Faith in Joseph was not lost. 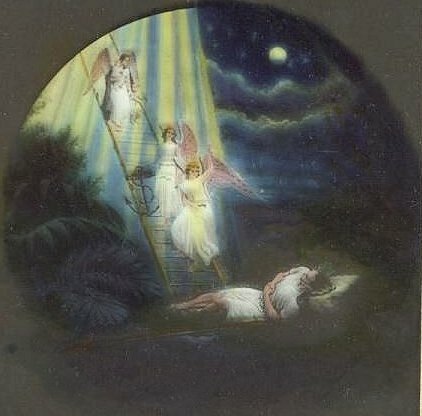 Between 1830 and 1836, under the supervision of Joseph Smith, many early Mormon converts enjoyed heavenly visions and spiritual raptures. However, after Joseph’s death in 1844, the great visionary period of Church history came to an end. The first 6 years of the church must have been amazing – its too bad it stopped!! I think dreams can be a wonderful source of spiritual nourishment and guidance. But I think the same about nature, art, film, literature, music, etc. The Universe/God speaks to us. What channel or frequency you are picking up the signals on is dependent on your unique personality, your cultural upbringing, and the channels you most frequently tune into. I don’t like to place limits on approved vs non-approved sources of spiritual nourishment. Yes, belittling a spiritual experience at church as being no more valid or powerful as watching a romantic movie is condescending. But so is the flipside: discounting a spritiual experience while watching a film as somehow less than valid/important/real as a spiritual experience in church. Some of my most profound spiritual experiences and epiphanies have originated in film. Our spiritual language since the beginning of time has always been symbol and story — scripture, temple ceremony, personal testimony spoken from the pulpit, etc. are all come to us via symbol or story. Film, music, literature all originates from God’s children… God inspires all, not just LDS. So just because a certain film didn’t originate in, or bear the imprimatur of the LDS Church, doesn’t make it a valid source for a spiritual experience. 4 – Carlos – sorry (it wasn’t me!). Multiple links always result in being placed in the moderation queue. 6 – Imperfection – Yes, I was wondering about this in writing the post. Was the first vision a waking or dreaming experience, and does that diminish the significance if it was a dream? 7 – James – The only thing that seems to have stopped from my experience is the “enthusiastic” public manifestations of spiritual gifts from the Kirtland era (to which I say good riddance). Personal individual spiritual gifts have not diminished at all if the people I speak with at church are to be believed, although not all experience significant dreams. As I suggest in the post, I believe that people who are susceptible to personally significant dreams are generally interested in the church when they hear about it because it resonates with them. I think people who have these experiences keep them sacred, and don’t share them for fame, noteriety, or money. Some share when moved upon by the Spirit to do so. Receiving answers to our prayers can be done in many ways. I testify that God uses dreams and visions to answer my prayers, as well as other means. This happens often. In the last month or so I have been given dreams on two different occasions in answer to prayer. In both instances I was taught that a decisions I made needed to be altered. Generally, I don’t remember my dreams. Most of my dreams mean nothing. When there from the Lord there is meaning and feelings associated with it. Hawkgrrrl–asked what the difference is between a vision and a dream. My experience with visions is limited to a few. My experiences with this form of Spiritual Gift occurred during the day. A vision is very powerful in its impact. There is no mistake that something profound has taken place and it changes your life. To close this comment I will say that I am limiting my comments about spiritual experiences because of a dream I recently had. Gifts of the Spirit are sacred and need to be related with care. I can just say that all that we read about in the scriptures is true. Heavenly Father will draw close to us if we will draw close to Him. He is no respecter of persons and will give the least and the greatest among us answers to prayers if we desire it and seek to keep His commandments. Note I said seek, for none of us can keep all the commandments, but if we’re sincere then we will receive grace in times of need. I also agree with the statement that visions and other spiritual manifestations continue in our day, but, due to the general lack of acceptance in or society, they simply are not shared as openly. My wife had a very clear dream concerning a daughter we would have. The most memorable part of the dream was the specific hair color. It was more than obvious; it was VIVID. It also was completely clear to my wife that this was an individual child – and that the dream really was a “manifestation”. Since my wife normally is not a “dreamer”, this one stayed with her. I have had a couple of “visions” in my life, but nothing like those described by Joseph and many early saints. Mine are more like suddenly seeing something very clearly in picture form – and they are unique for me in that I simply don’t “see” things in picture form, ever. I just am not a visual person. That also highlights the last reason, imo, that we live in a less “visionary” time. We define “visions” in light of “spectacular” events and often fail to recognize our own experiences as visions. Ray 12 due to the general lack of acceptance in or society, they simply are not shared as openly. Ray I think your right on this – I have had two close friends share experiences with me. And neither are the type to tell whoopers! I am so cynical that I still doubt and look at possible motives. Heavenly manifestations occurred in a March 18th 1833 sacrament meeting held in Kirtland Ohio under the direction of Joseph Smith. Bro Joseph after which many of the brethren saw a heavenly vision of the savior and concourses of angels, and many other things, of which each one has a record of what he saw. Would you really say good riddance if you saw something like this? Are you saying good riddance because you think they were whipped up to believe they saw something? Or are you saying it makes the modern day church look a bit mad to believe in this? Visions and dreams at times are the homesickness for our eternal home. I personally know them to be real, as I have had many experiences that have indicated to me that God speaks to us through dreams. Some experiences, of course, are too sacred to share. I’ve had maybe two dreams in my life that I found _very_ significant. In neither case am I sure that they were revelations from God. They may have only been my own subconscious speaking to me in a significant way. This one, however, I had right at the time I left the church, and I remembered it explicitly and wondered about it. It helped me not only realize that some day I’d return to church, but told me pretty much how I was to behave when I did. I’m sitting in a large, even cavernous, Mormon chapel. There is a medium sized congregation. They are all listening intently to a man who is a speaking. I am listening, too, but can’t make out what the man is saying, it seems like gibberish to me. I look around, and see that a large whole has been blown away in the side of the church. Outside the church thier is a beautiful storm going on. A great wind is swweping things up into the air in a way that seems magical to me. I notice parts of houses, and animals. It is very exciting to me. I know that I’m going to walk out in it, and am excited about it, as a person who has been stagnant may be excited about returning to life. As I prepare to go out, my grandfather walks back into the church through the breach. (My grandfather is someone I relate to as someone like me.) He is naked, emaciated, both terribly bruised and frostbitten. Another relative, seeing him come to sit down, is embarrased for him and tries to cover him with a blanket. He explcitly refuses to be covered, and turns to me with a deep, meaningful and urgent look. I once had a mission companion who talked openly with me about seeing visions. My first thought was: great, I have a crazy companion, but I soon realized that he was telling the truth and admired him for his personal strength. Even since then, when people have talked about deep spiritual experiences at church, I’ve shifted in my seat uncomfortably and I wasn’t the only one. Maybe the lack of dreams of visions we experience is our deep-seated desire to not be seen as crazy by everyone else. And that is unfortunate…for everyone. James said–“A meeting in which visions were occasioned by the application of anointing oil, which can also be laced with entheogenic material occurred on January 21, 1836”. There is a pithy maxim that covers far out comments: If my Aunt had (testicles) she would be my Uncle. I was referring to the “enthusiastic” spiritual manifestations (along the lines of the shakers) where people were jumping up and speaking in tongues and others were spontaneously exclaiming things out loud. There is also the disturbing incident in the schoolhouse where JS was initially going to give the brethren the MP and instead they saw people in contortions, which JS then condemned as not being from God. So, I say good riddance to the physical contortions and the verbal outbursts. To the dreams and visions, even if in a public setting, I don’t necessarily believe they have ceased. People don’t share these types of experiences any more because we personally doubt them, we know others will scorn them, or they have personal significance only. But in reality, the significance of someone else seeing a vision of the Savior in the 1830s is primarily significant to them, not to me. Who am I to dismiss my own experiences as less grand and less important? They are surely more important to me personally. Back then, people felt the end of days was at hand and that they were ushering in the second coming. They were whipped into a fervor in some cases. Many also joined the church because of this aspect (many of those soon fell away when JS condemned some of the enthusiasms as going too far). Thomas Parkin – what a great dream! At one time in my journey, I thought people who talked of visions and dreams were a little odd. It now seems odd to me that a church built around the concept of communication with God would take, in many cases, a dim view of these experiences. I have taken to working to remember my dreams and writing them down upon waking. I have found that by prayerfully considering the contents of my dreams, that I can gain an understanding of things that are happening around me. I have have several dreams that have provided a ‘picture’ that ultimately came to be. My dreams sometimes are literal with the people I interact with portrayed in the dream segment. Most of the time, I believe my dreams carry symbolic meaning which is where prayer and pondering come in. “Behold, he hath heard my cry by day, and he hath given me knowledge by visions in the night-time.” Visions of the night, I have to assume are dreams. I do have a question for you fellow dreamers. Have you ever noticed whether you have ever felt the touch are noted the tactile feeling of touching someone or something in a dream? I do believe there is an interesting aspect to dreams that I do not fully understand. My thanks to Thomas, I do enjoy hearing such. Sometimes I yearn for a private place to discuss these types of experiences. The storm in your dream and the end of your dream resonates strongly with the dream-time revelation I received which brought me back to a knowledge of God’s reality. Faith was never a gift I was blessed with; I operate by logic, and so my primary logical conflict as a child Mormon was always: “How can I say ‘I know this church is true’ before I know all the others to be false?” (an interesting view of the process of elimination, to be sure). I eventually became inactive through the loss of my first love (a non-Mormon girl), and through subsequent study I became wholly convinced of the truth in anarchistic and atheistic philosophies. So I became involved in “freethought” and went to Secular Student Alliance conferences, etc. I was flown through space and time by this companion as he delivered a lecture on the rise and fall of man in the dispensations of civilization. The lecture spanned the entire development of humanity, showing the process of the progressions and collapses, and the devices by which man was deceived at the height of his righteousness. When the lecture was concluded with present day and future events, we went back to the beginning and the lecture was repeated and condensed. This happened several times, with the lecture being repeated and made more concise, until the monologue was reduced to three steps or principles by which man is deceived. These three steps, or the three sentences which described them, were repeated countlessly until I woke. Upon waking I could remember only the moral of the lecture: That all of mankind has been deceived into worshiping the Sun-god, and that we are all therefore in violation of our covenant with the real God, and that judgment is thereby pending and imminent. I could remember that “the three principles by which man has been deceived throughout all of history” were repeated, but I could not remember a word of these 3 principles. I spent that entire Independence Day researching sun-gods on the Internet, when about mid-day I remembered that I had tried to communicate “the 3 steps or principles by which man has been deceived” to my girlfriend as she was getting ready for work very early that morning. I called her pharmacy (she is a pharmacist) and asked, “Did I say anything weird this morning?” She laughed and said, “Yes.” She said I had rolled over sitting up a bit, that I looked up at her almost disparagingly, and said, “Did you know, you woke up under the Egyptian presence because you were naked under a sheet?” I lifted up the sheet I was under as I said the last part, and I rolled over and went back to sleep; and she realized I’d been sleep-talking when I refused to respond to her further attempts at communication. I still don’t know the 3 steps by which we are all deceived into worshiping the Sun-god. But from this dreamscape vision I now know and am certain about the reality of God, and I feel as though that dream was my calling back into the “body of Christ”. I recognize that I am still probably in the same desperate condition that was communicated to me in the dream, but I am trying to remain aware of that condition. I feel now like my worldly wanderings after losing faith and prior to this dream were directed by the Lord, that by the process I was taught discretion and doctrine, and that I was shown long-ways how “all the others are false”. I have also since found many parallels in Scripture to what I remember about this dream, for example, stuff in Isaiah 30, “to cover with a covering that is not of my spirit” and trusting in the shadow or presence of Egypt, etc. While this may be how some have tried to explain away spiritual experiences, many of us have had our world view altered from much more church centered experiences that proved wrong later. I’ve posted before about feeling the spirit listening to Paul Dunn or George Lee only to find out later that God wouldn’t have supported either one of those GA’s. Priesthood blessings that were dead wrong despite everyone claiming God was in it. Priesthood callings to brethren who were later convicted of molesting the very youth they were called to serve and further investigation showing that they had molested others even before being called. While I served as a High Councilman, we sustained a man to serve in a bishopric who later was found to be having an affair for years. In all of these situations, everyone was sure they were feeling the spirit and yet I can’t imagine a God who would be part of any of it. After studying much of the un-correlated history of the church, praying about its truthfulness brings completely different feelings then it used to. Just as many of the examples given above, knowledge truly is power. Had much of the information about peoples backgrounds, health problems, and alike been known, I believe the callings, blessing, and so forth would have been different. Doug G – Well, since I’m the M in IME, I would classify two types of experiences: emotional and spiritual. Most of what I experience at church is just plain and simple emotion. People often refer to it as feeling the spirit, but I don’t agree. I not only don’t consider those spiritual experiences when I have them, but I also doubt they are when others do. Obviously, they might disagree with me on that. 90% of the emotional experiences at church probably fall into that category, things like: expressing gratitude, sharing a touching or sad story that is personal, feeling nervous about speaking of personal matters in front of others and your voice gets cracky, etc. Feeling the spirit to me is not in the same part of the body. Emotional feelings I have usually start in the upper chest or throat and travel upward through the eyes or cause some shaking in the hands. Spiritual feelings start lower in the diaphragm and fill/expand the upper body with warmth vs. exiting the body. With emotional, there’s a suppression and a release of the emotion. That sounds weird to some, I’m sure, but it’s the difference I feel between the two types of experiences. The energy is just not the same. I couldn’t always tell the difference, but I have really paid a lot of attention. I am careful not to confuse the two because I think most of the stuff people feel in F&T mtg or during lessons is simply emotion. I had read somewhere that when you cry, it can always be linked back to some form of emotional sadness. Whether you cry because you are “happy” or whatever, it’s still got the same root cause: sadness (e.g. crying at a wedding is supposedly happy but is also the end of a chapter of life). That was why I started to pay attention. I was sitting next to my mom in RS a few years back, and she was crying. She said, “Everybody keeps thinking I’m so spiritual, but it’s this stupid heart medication they’ve got me on. It just makes me have this crying reaction.” I think she was afraid they were going to call her to be the RS president or something. Most of the time, I don’t remember dreams. When I do, they have some intriguing point or it is because I wake up in the night after them. I’ve had some of the recurring dreams that you mentioned. One was remembering that I had enrolled in a college course and had forgotten to attend it until the end of the semester. Another one that I’ve had different versions over and over is being called on a second mission (always I’m somehow still single in these dreams). Then slowly I come to realize that various life stages have already passed, making it more difficult to accept the call. Would this be the stress of being found inadequate? I had a series of disturbing dreams after a close friend committed suicide. One involved seeing my friend in a familiar setting with other friends around us, then remembering that he couldn’t be there because he was deceased, so I would turn to see if other living friends could see him and then looking back he was gone. This would produce the feeling of discovering his death all over again. Needless to say, that wasn’t a very pleasant time. I have these different dreams journaled somewhere. They were disturbing enough that I tried to reconcile the images I was seeing. I had one dream on my mission where I saw clearly a house that we had already tracted and there had been no answer. It was on a major road, so we passed it every day and I saw the house during the day repeatedly. There wasn’t any message with the dream and I assumed it was just a random one. The last night of my mission we passed it, so I decided ‘what the heck’ and stopped there one more time. It turned out to be a good conversation with the household head, but no teaching appointment came out of it, so I assumed it was just a dream and not a vision. I had a dream that did leave me inspired while dating the woman who is now my wife. I struggled as to whether to share feelings, as she had received a mission call and I had been reluctant to do anything which would take her away from that. I dreamed that I told her I loved her and that her response to that was positive. Eventually, I did just that and it has turned out well. I would describe this one as being in your category of discovery! That friendship turned out to be a treasure much grander than expected! #5 Scientists say that deja vu is only a response to our brain when we are too tired. The brain just can’t store anymore memory and so reject it right away. When I got this scientific explanation I noticed that most of my deja vu moments were when I was extremly tired. But then I tried a little game to see what happens. Anytime I have a deja vu and I can truly say what I am going to do and what is going to happen I behave the opposite. Talking about the subject of vision I know someone who had one. He was told by God Himself that he was going to be called as a bishop and latter a prophet. And that he would have a son who would become a prophet also! Yes! This is right. And this man is my daddy (no worry about my gene pool here he is only my adoptive father). Do I need to tell you that he has only daughters and that despite the fact that he married a woman who is my age and tried to have a baby he is still not going to bread a boy? Thanks for your very considerate answer to my ramblings. I think we’re in agreement here with your 90/10 split on what truly is the spirit as opposed to what’s simply emotion. I may have even been a little more generous at 80/20. I’ve also believe the same ratio exists in other churches with the good members being caught up in the emotion of the meeting most of the time, but every once in a while getting a nugget of truth with the accompanying spirit. Dreams and visions have been a big part of my family’s history has well. My brother claims to speak with his dead wife on occasion and has claimed to get messages from God in dreams. I can’t tell you if my skepticism of his experiences results from my own lack of faith or jealousy that these type things have never happened to me. Doug G. – “I may have even been a little more generous at 80/20.” You’re probably just more spiritual than I am or have fewer distractions next to you on the bench at church :). I totally agree that this is true in other church services as well (feeling the spirit), although the personal manifestations of the gift of the HG is not common among my non-LDS friends (yet another distinction in spiritual experience). And certainly, people in all religions (LDS is no exception) try really hard to make you feel it, which always irritates me. Genuine feeling is one thing, but I don’t like the faking of it. We were at a reconstruction of the Hebrew tabernacle run by the Mennonites a few years ago, and the guide was doing this testifying thing, raising her voice up and say “praise be to Jesus” and raising and lowering her hands, and then she asked if others wanted to join in praise. I’m quite sure she was disappointed we didn’t leap up and join the “show,” although the tabernacle itself was pretty cool and I said so. I was surprised because back in the day, the Mennonites were not so evangelical. It seems to be in vogue. Access to significant dreams seem almost hereditary to me. As to your brother’s experience, a friend who was a grief counselor said conversing with one’s dead spouse (and occasionally other deceased relatives) is so common she has grown to believe it is a normal part of the grieving process for those who are attuned. Skepticism about others’ experiences or belief in them seems to make little difference to me personally. My own experiences are the only ones I really find totally convincing. There are certainly some people whose experiences I would roll my eyes at (even when I shouldn’t) and others I would believe pretty readily. Since you brought up sleep paralysis, have you done any research into incubus and succubus spirits? That might shine some light on your discussion.